I had asked for clarification as to whether the poster was talking in Canadian dollars or American dollars. He didn't specify in his posting, so I was wondering which dollar it was. True, you don't pay onerous duties when shipping out of Canada. The penalties come when you ship into Canada. I have mailed packages to the USA but not DVDs, and Canada Post's rates are crazy. When the US Postal Service increased their rates to Canada, though, things got equally crazy going the other way. I've had to sign for delivery charges of nearly $30 to take delivery of a couple of recent purchases of items costing $20. In the end, I just wanted the poster to be sure he was getting the price he thought he was getting. In my experience, the biggest factor in Canad-USA cross border shipping is the carrier and associated brokerage fees. If it's shipped via the postal systems, then typically all you have to pay is the duty, if it's above the duty free amount, and whether you even pay that is all down to the mood of the person on duty. However, if it's being shipped via a private carrier service service, such as UPS or Fed Ex, then they pay the applicable duties on your behalf and tack on an often exorbitant service fee for handling the paperwork. These brokerage fees can quickly erase most or all savings. Jim Roots wrote: In the end, I just wanted the poster to be sure he was getting the price he thought he was getting. I wasn't sure until I pre-ordered last night. I'm still not sure because I don't understand an almost $60 difference in price. I'm still leery about the Canada order after problems I began having with DVD's from Amazon UK. Twice my local post office received, then tried to return, UK DVD's (packages were stamped "not USPS"). I only got them because my mailman pulled them out of the return box and delivered them anyway. Tipping him good at Christmas paid off, but caused me to rethink orders from outside the US. If Amazon U.S. reduces the price of the Lang set, I'll cancel the Canada pre-order. T0m M wrote: In my experience, the biggest factor in Canad-USA cross border shipping is the carrier and associated brokerage fees. If it's shipped via the postal systems, then typically all you have to pay is the duty, if it's above the duty free amount, and whether you even pay that is all down to the mood of the person on duty. However, if it's being shipped via a private carrier service service, such as UPS or Fed Ex, then they pay the applicable duties on your behalf and tack on an often exorbitant service fee for handling the paperwork. These brokerage fees can quickly erase most or all savings. Yes, that's what I'm talking about. UPS charged me nearly $30 for a DVD that cost $20, just a few weeks ago. I don't know if this is a privilege of being a Commonwealth country, but I get fabulous postal service from the UK. Just recently I ordered three books from amazon.uk and they delivered in 4 days. Last winter I got the Steve Coogan Collection DVD from the same source and it delivered in about three business days. I order used books from British dealers all the time and, with very rare exceptions, they deliver within days ... and then follow up via email to make sure I got them. Jim Roots wrote: Yes, that's what I'm talking about. UPS charged me nearly $30 for a DVD that cost $20, just a few weeks ago. I self-cleared a Doctor Who Series 1-7 box set that I ordered for my son a few years back. The CBSA officer didn't have a clue what I was talking about, nor did his superior. However, after I showed him the web print-outs he contacted his counterpart at the Windsor border crossing who conformed its legitimacy. IIRC, it saved me about $50 CDN. I live close enough to a border crossing that I usually just have packages shipped to a friend on the USA side and go over to pick them up. However, some USA companies won't ship to addresses other than the billing address associated with the credit card. I guess that I can't blame them, given all the identity theft. Regardless, that's when the self-clearing process comes in handy for me. Jim Roots wrote: I don't know if this is a privilege of being a Commonwealth country, but I get fabulous postal service from the UK. Just recently I ordered three books from amazon.uk and they delivered in 4 days. My last couple of orders from UK to CA(lifornia) have been similarly speedy. Maybe CA is a charmed abbreviation. Or maybe it just that it not yet the holiday season. Major price drop today, folks, on Lang Blu-Ray box. $94.29. Bob Furem wrote: Major price drop today, folks, on Lang Blu-Ray box. $94.29. Thanks. Good news as I cancelled my Canadian order a couple days ago because my mailman is being reassigned. I've had too many problems in the past with non-USA orders that only got delivered because my previous mailguy pulled them out of a return box. I hate my post office and send all my outgoing mail from a neighboring town. Bob, thanks. I had been on the fence with this purchase, but that price is too good to pass. Ordered. So is this blu-ray box-set going to get a UK release by the Eureka: Masters of Cinema series? Because isn't that what usually happens with these Kino box-sets when they finally end up on British shores? It's just that the reason I ask is because I have been caught out before with KINO. I've seen a box-set that is appealing, and is a Must-Have buy (such as this one). And I have waited and waited for it to come to Amazon.co.uk to no avail. So I've bought the KINO version from Amazon.com in America, only to risk being stung by import taxes. And then a month or two down the road the Eureka Masters of Cinema guys go and release it legitimately in the UK. 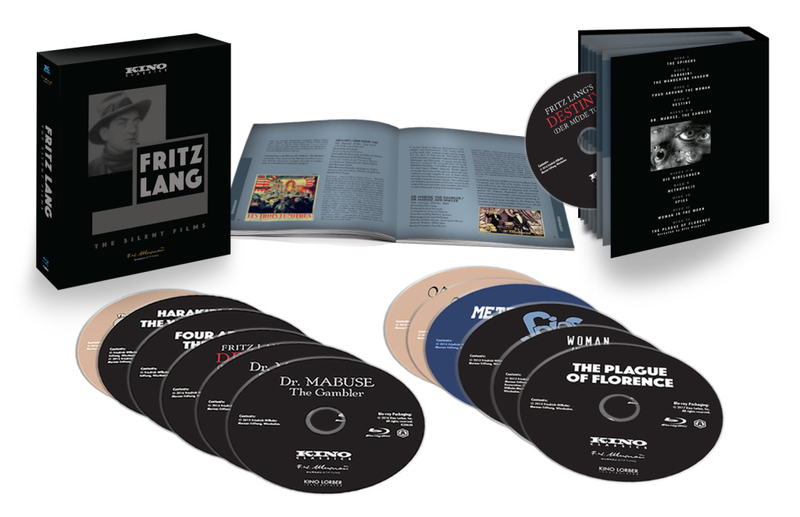 Here's a look at the layout of our Fritz Lang box, which will be released tomorrow. It includes a 32-page booklet essay by film historian Tom Gunning. I checked out Destiny and it repeats every - fifth? - frame. So the the visual rhythm is totally destroyed. 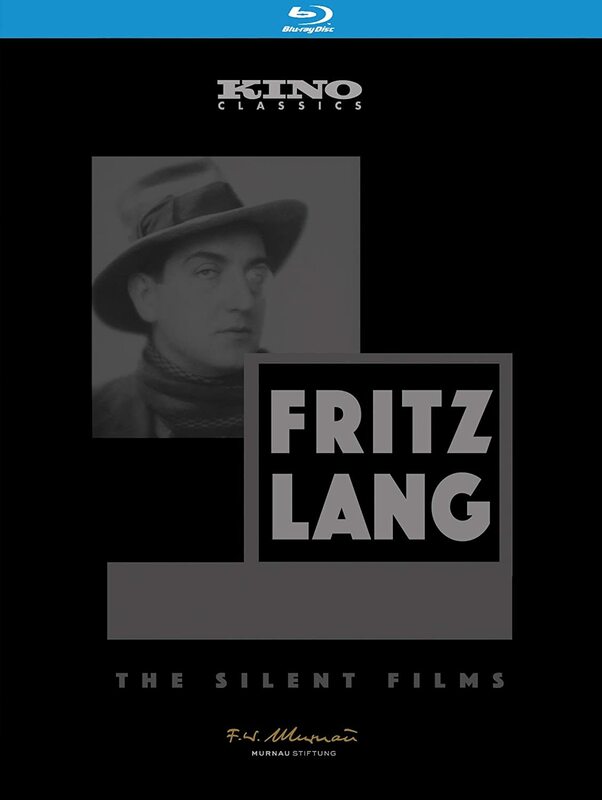 "Few filmmakers of the silent era had as much impact as the great German stylist Fritz Lang, whose films were instrumental to the look and feel of the German expressionist movement, and whose Metropolis (above) influenced literally 90 years of cinematic future dystopias. This stunning new box set from Kino-Lorber collects his surviving silent features, eleven in all, beautifully restored and supplemented. Sure, start with Metropolis – but every one of these is a gem, challenging yet engaging, aesthetically striking yet emotionally audacious"
Saint-Just wrote: I checked out Destiny and it repeats every - fifth? - frame. So the the visual rhythm is totally destroyed. Step printing is utterly unnecessary in the Blu-ray format. Disappointing. Just got this today. Quite an impressive little box with nice art throughout and a booklet. Destiny looks very good. I'll take your word for it that it's step-printed, because it's imperceptible to me (especially given that some scenes are a bit choppy anyway), but I looked for parts where the footage seemed complete and I saw no issues. Thanks for the perspective Mike. That last post had me worried. Honestly, this is a dream set. It would be far more tempting if I didn't have all but one of these features, all in dvd format. I haven't even opened the Early Lang set yet. I am a little concerned about the cardboard holders for the discs. The Murnau Borzage box set, Hitchcock set, and many others all had issues, glue on the discs, scratched discs, difficulty removing discs. How does this one do? I had no difficulty removing them, I see no glue, I got no scratches. Honestly, I've had no problems with any such set, though—if I get a scratched disk it's because the standard plastic spindle broke, leaving the disk to bounce around in its case. I would have thought, in this day and age, step printing would have disappeared completely - there's no need for it whatsoever. You'd think so, but you'd be wrong. Plenty of archives still send out their masters with step-framing, and I think, unfortunately, there's not much of a choice when you're the licensee. I'm going to watch some of the Lang films in the Kino box set for Watch That Movie Night, but over Christmas break my older son wanted to see one he hadn't seen (anything but Metropolis or Spies, then) and so he and I watched Siegfried, and then I finished it off with Kriemhild's Revenge. I often forget where I've seen things before, but I know this was exactly the 4th time each for both films. Once in 16mm in college around 1982, a double bill which means they must have run under 3-1/2 hours total; once on Blackhawk Beta tapes around 1986; the previous Kino DVD set around 2003 or 2004, and now this blu-ray. The first two times they were mainly visual spectacle, the compositions that everyone always called "architectural" (because Lang started as an architect); the story never really made sense or entirely compelled me until the Kino DVD, which finally seemed complete and coherent enough to make it all work. It worked, but comparing that edition to this one, this one is an enormous leap in visual quality. (I assume it's identical to the edition they released in 2012, not least because the menus are the same). The compositions and patterns on the costumes were striking before, but they only improve with the remarkably detailed, shot-yesterday quality of most of this edition (some shots, less than 5% of the total, come from weaker material, but these shots really don't stand out). The visuals are paired with the Gottfried Huppertz score from the 20s, which ranges from pseudo-Wagner to pseudo-Khachaturian (when Attila the Hun is around), and is bombastically fitting throughout. Seeing it like this, I'm increasingly convinced that this (taking the two parts as one) is the masterpiece of Lang's silent work— yes, Metropolis will always be the most famous and visionary one, but we all know Metropolis can be a little loopy at times. Where this is a powerfully grim march to doom over 4-1/2 hours, first Siegfried's doom due to the trickery that won King Gunther the hand of (the deeply pissed-off) Brunhild, then everyone's doom at the hands of Siegfried's dead-inside widow Kriemhild. It's so grim that even those who disagree with Siegfried Kracauer generally have to admit that any country that adopted this as its national myth is going down in flames eventually. Like the first two Godfather films, it's an epic myth of a country's founding deep in deceit and violence. More to come in the Watch That Movie Night thread. Any news if Eureka/Masters of Cinema is going to release their version of this set (of even MK2, for that matter) ? I agree, as long as DR MABUSE and DER MÜDE TOD are placed on the same pedestal. What makes the superbly self-confident work of Fritz Lang in this phase of his career so outstanding is a combination of things. There is a boldness of concept and execution on a par with Griffith and DeMille at their best. There is an assuredness of taste that keeps corniness to a minimum. And there is a joy of storytelling that just draws you in and (at least in my case) makes you suspend your disbelief most willingly. What is "Step Printing"? Can someone explain? Is that right? If so -- wouldn't it be too fast to notice? Plus? Why do they do this in the first place? For what reason? Basically correct. They do it to slow down the film, so dramas don't play at Keystone Kops speed. I think it's often unnoticeable, others think it sticks out like a sore thumb. Mike Gebert wrote: Basically correct. They do it to slow down the film, so dramas don't play at Keystone Kops speed. I think it's often unnoticeable, others think it sticks out like a sore thumb. It's NEVER unnoticeable, if you know what a silent film is supposed to look like - amazing that Olive Films could release The Captive without repeating a single frame and not have it race like slapstick - they must be trafficking with the devil or something. PLUS if we arbitrarily compute Destiny at 20 frames per second that's four extra frames PER SECOND - how can that be unnoticeable? And that's one of the lesser examples of step printing. I think they do it to make it look 'natural' and that's not how a silent is supposed to look.